Advanced Manufacturing Service's quality objectives are to provide quality products to its customers in accordance with the customer's requirements. AMS has adapted IPC-A-610 and J-STD-001 Class II as its workmanship standards. 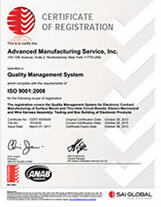 AMS is an ISO 9001:2008 certified company. Advanced Manufacturing Service's Quality Policy is to provide products and services that consistently meet or exceed the standards set by our customers and which are delivered on and at the greatest value. Advanced Manufacturing Service is committed to comply with requirements and continuously improve the effectiveness of the quality management system. Copyright 2013 Advanced Manufacturing Service, Inc.